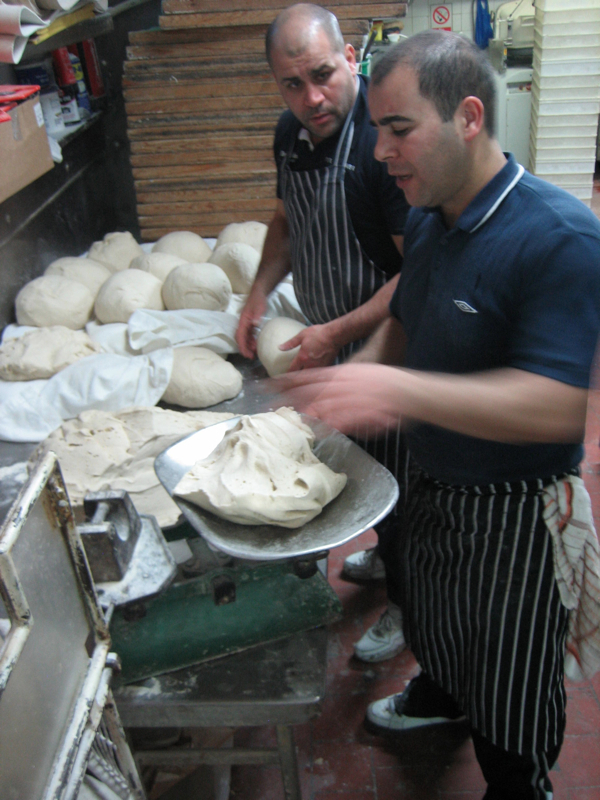 New Year’s Eve is always the busiest night of the year at the Brick Lane Beigel Bakery, so yesterday I chose to spend a night accompanying Sammy Minzly, the celebrated manager of this peerless East End institution, to observe the activity through the early hours as the staff braced themselves for tonight’s rush. 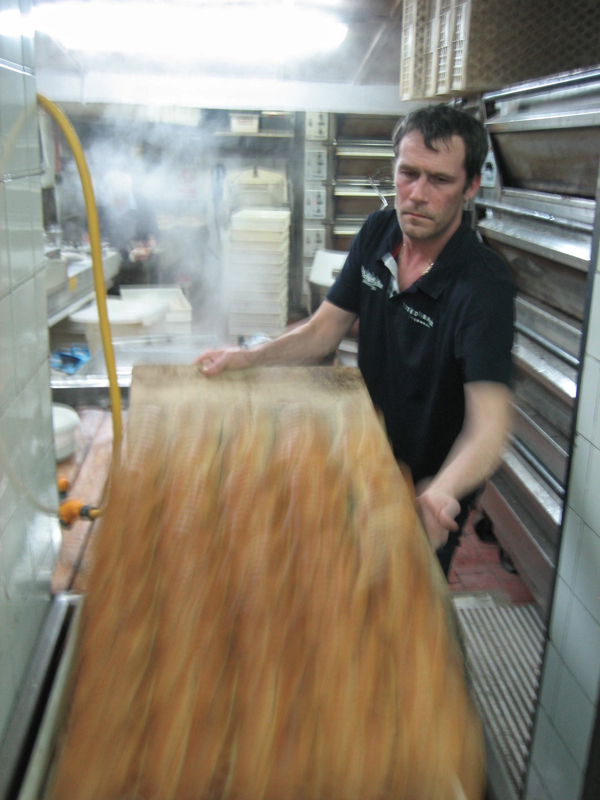 Yet even though it was a quiet night – relatively speaking – there was already helter-skelter in the kitchen when I arrived mid-evening to discover five bakers working at furious pace amongst clouds of steam to produce three thousand beigels, as they do every day of the year between six at night and one in the morning. 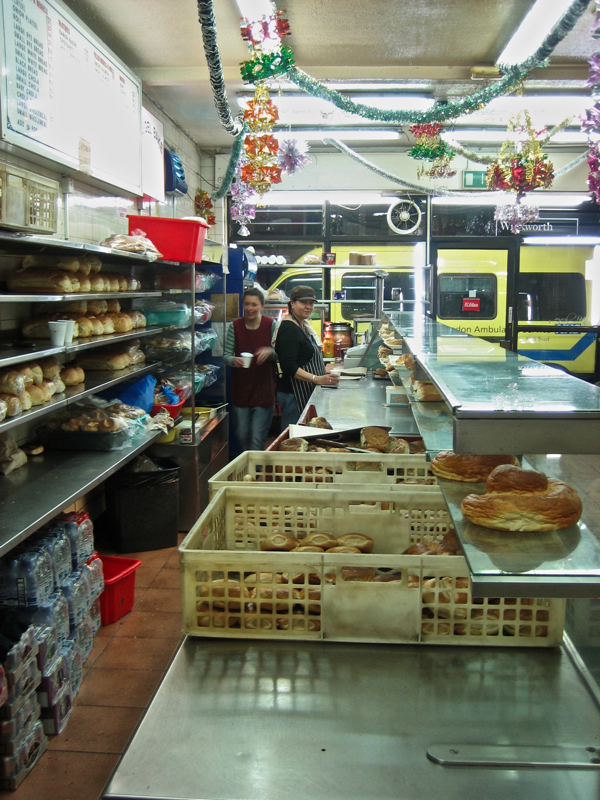 At the centre of this tiny bakery which occupies a lean-to at the rear of the shop, beigels boiled in a vat of hot water. 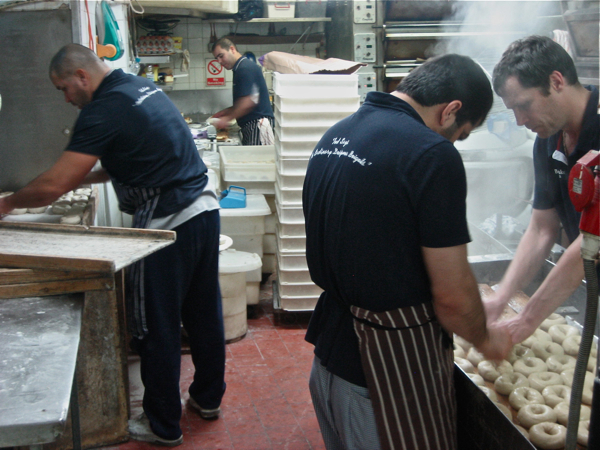 From here, the glistening babies were scooped up in a mesh basket, doused mercilessly with cold water, then arranged neatly onto narrow wet planks named ‘shebas,’ and inserted into the ovens by Stephen the skinny garrulous baker who has spent his entire life on Brick Lane, working here in the kitchen since the age of fifteen. 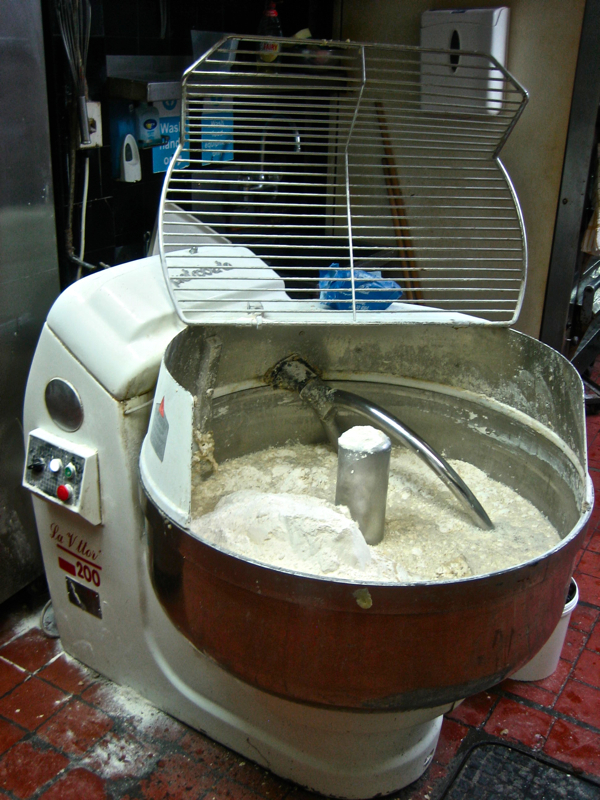 Between the ovens sat an ogre of a huge dough-making machine, mixing all the ingredients for the beigels, bread and cakes that are sold here. It was a cold night in Spitalfields, but it was sweltering here in the steamy atmosphere of the kitchen where the speedy bakers exerted themselves to the limit, as they hauled great armfuls of dough out of the big metal basin in a hurry, plonking it down, kneading it vigorously, then chopping it up quickly, and using scales to divide it into lumps sufficient to make twenty beigels - before another machine separated them into beigel-sized spongey balls of dough, ripe for transformation. In the thick of this frenzied whirl of sweaty masculine endeavour – accompanied by the blare of the football on the radio, and raucous horseplay in different languages – stood Mr Sammy, a white-haired gentleman of diminutive stature, quietly taking the balls of dough and feeding them into the machine which delivers recognisable beigels on a conveyor belt at the other end, ready for immersion in hot water. 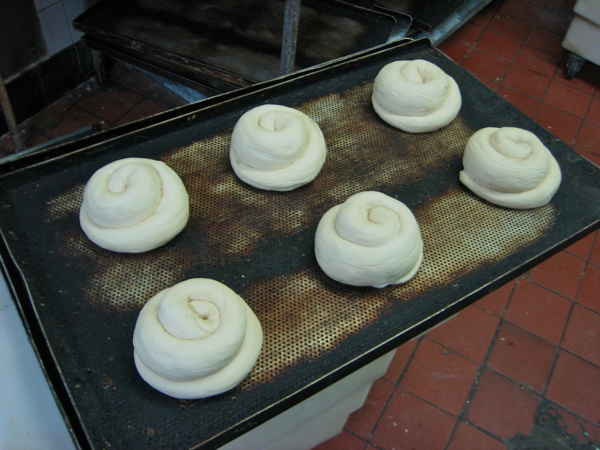 In spite of the steamy hullabaloo in the kitchen, Mr Sammy carries an aura of calm, working at his own pace and, even at seventy-five years old, still pursues his ceaseless labours all through the night, long after the bakers have departed to their beds. 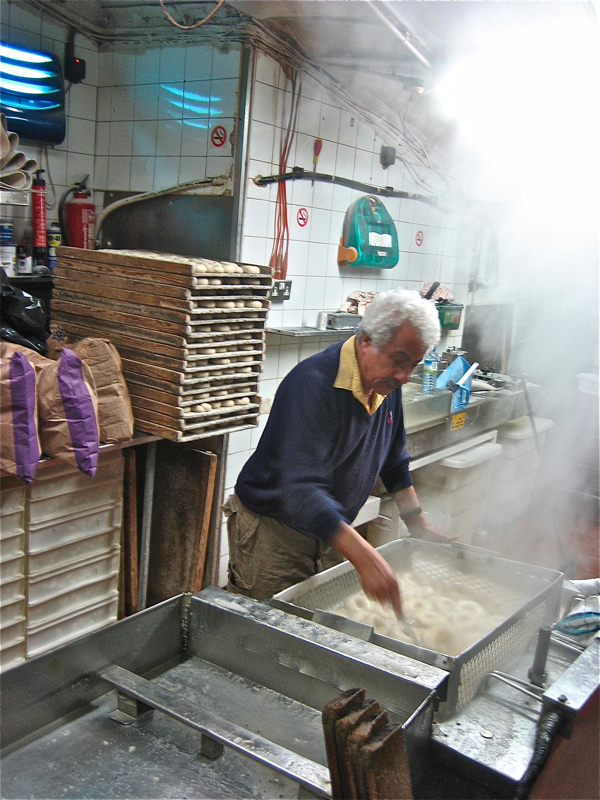 Originally a baker, he has been working here since the beigel bakery opened at these premises in 1976, although he told me proudly that the Brick Lane Beigel Bakery superceded that of Lieberman’s fifty -five years ago. Today it is celebrated as the most visible legacy of the Jewish culture that once defined Spitalfields. 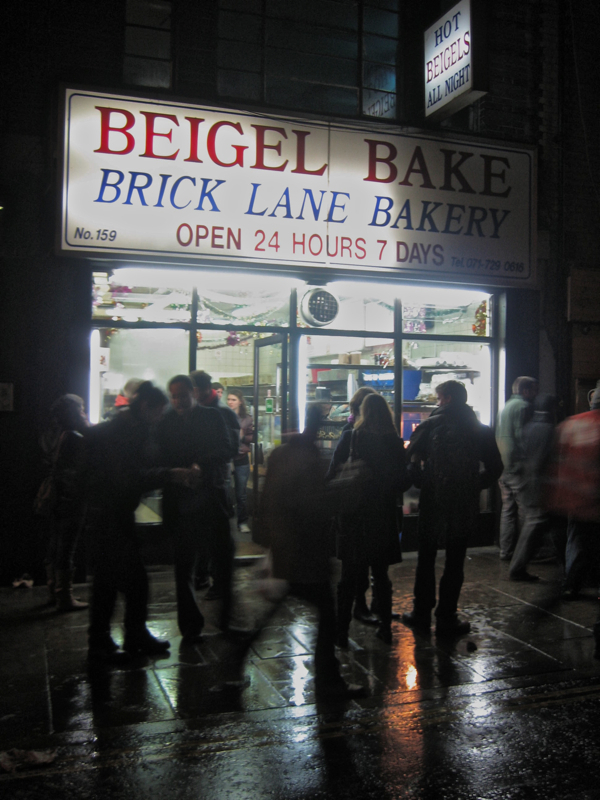 Hovering at the entrance to the kitchen, I had only to turn my head to witness the counterpoint drama of the beigel shop where hordes of hungry East Londoners line up all night, craving spiritual consolation in the form of beigels and hot salt beef. They come in sporadic waves, clubbers and party animals, insomniacs and sleep walkers, hipsters and losers, street people and homeless, cab drivers and firemen, police and dodgy dealers, working girls and binmen. Some can barely stand because they are so drunk, others can barely keep their eyes open because they are so tired, some can barely control their joy and others can barely conceal their misery. At times, it was like the madhouse and other times it was like the morgue. 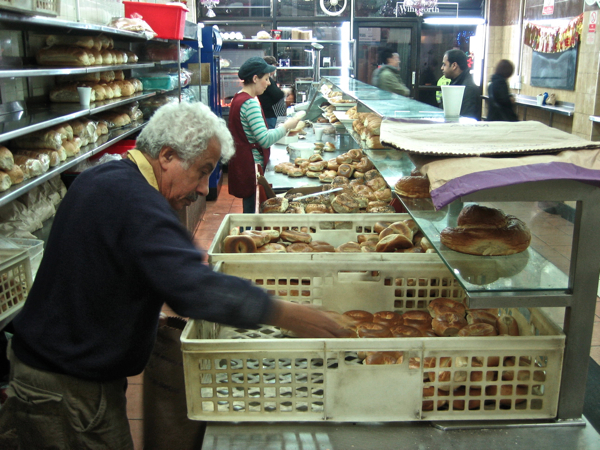 Irrespective, everyone at the beigel bakery keeps working, keeping the beigels coming, slicing them, filling them, counting them and sorting them. And the presiding spirit is Mr Sammy. 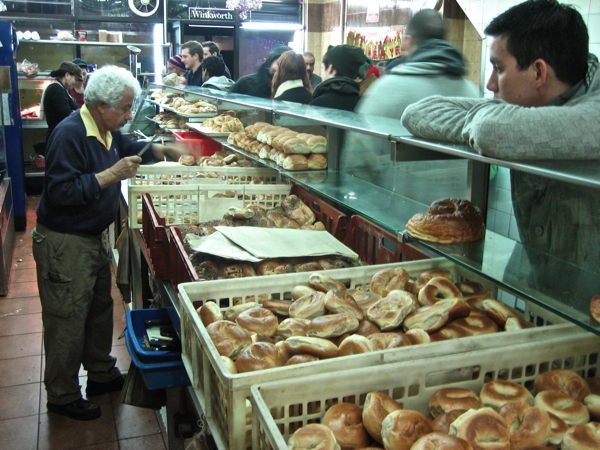 Standing behind the counter, he checks every beigel personally to maintain quality control and tosses aside any that are too small or too toasted, in unhesitating disdain. 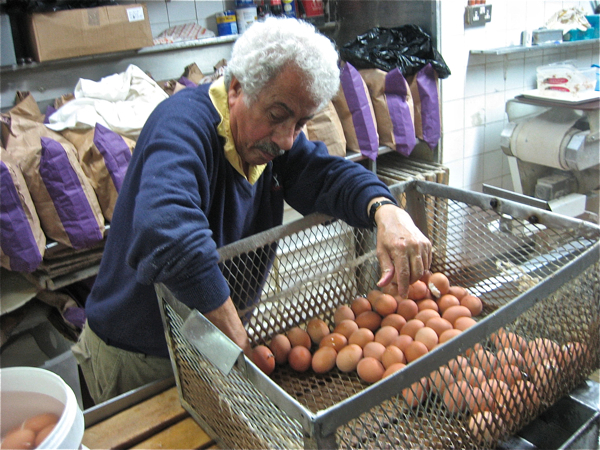 Later he boiled one hundred and fifty eggs and peeled them, as he explained me to about Achmed, the cleaner, known as ‘donkey’ – “because he can sleep anywhere” - whose arrival was imminent. “He sleeps upstairs,” revealed Mr Sammy pointing at the ceiling. “He lives upstairs?” I enquired, looking up. “No, he only sleeps there, but he doesn’t like to pay rent, so he works as a cleaner.” explained Mr Sammy with an indulgent grin. Shortly, when a doddery fellow arrived with frowsy eyes and sat eating a hot slice of cake from the oven, I surmised this was the gentlemen in question. “I peeled the eggs for you,” Mr Sammy informed him encouragingly, a gesture that was reciprocated by ‘donkey’ with the merest nod. “He’s seventy-two,” Mr Sammy informed me later in a sympathetic whisper. Witnessing the homeless man who came to collect a pound coin from Mr Sammy nightly and another of limited faculties who merely sought the reassurance of a regular handshake, I understood that because it is always open, the Beigel Bakery exists as a touchstone for many people who have little else in life, and who come to acknowledge Mr Sammy as the one constant presence. With gentle charisma and understated gesture, Mr Sammy fulfils the role of spiritual leader and keeps the bakery running smoothly too. After a busy Christmas week, he was getting low on bags for beigels and was concerned he had missed his weekly deliver from Paul Gardner because of the holiday. The morning was drawing near and I knew that Paul was opening that day for the first time after the break, so I elected to walk round to Gardners Market Sundriesmen in Commercial St and, sure enough, on the dot of six-thirty Paul arrived full of good humour to discover me and other customers waiting. Once he had dispatched the customers, Paul locked the shop again and we drove round to deliver the twenty-five to thirty thousand brown paper bags that comprise the beigel shop’s weekly order. Mr Sammy’s eyes lit up to see Paul Gardner carrying the packets of bags through the door in preparation for New Year’s Eve and then, in celebration of the festive season, before I made my farewells and retired to my bed, I took advantage of the opportunity to photograph these two friends and long-term associates together – both representatives of traditional businesses that between them carry significant aspects of the history and identity of Spitalfields. 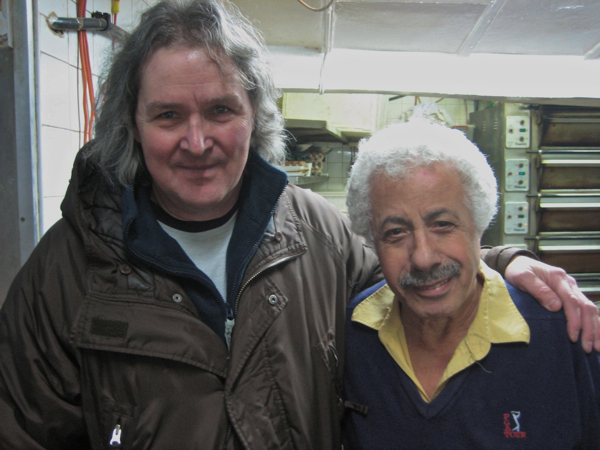 Old friends, Paul Gardner, Market Sundriesman, and Sammy Minzly, Manager of the Beigel Bakery. I love this article and these photos. Thank you gentle author. I lived in Whitechapel and Bethnal Green briefly and I miss my wanderings around the East End. Your blog is the next best thing! Bonjour et bonne année et merci pour les “beigels”. Je donnerais toute ma baguette de ce matin pour une beigel toute fraîche. Thanks Gentle aurthor, I am now siting here at home in Harlow, hungrey for a biegel!! Whenever the family and I end up in the area after a day out in London we always end up at the biegel shop, best food in London. Do you have any idea what you are doing here? This is the stuff all food historians would give their eye-teeth to write. How fantastic that you are recording the lives of these people, who might not ever have had their voices recorded otherwise. Beautiful, universal writing. Thank you. I am a great fan of Mr Sammy’s salt beef beigels, but never a fan of food articles, yet you have converted me – this is a superbly crafted post and utterly pleasing in every way. I move back to Scotland a few years after 20 years in London, working in the City, than at Blackfriars and finally Spitalfields. I have just stumbled on this article and it has made me realise how much I loved this shop. 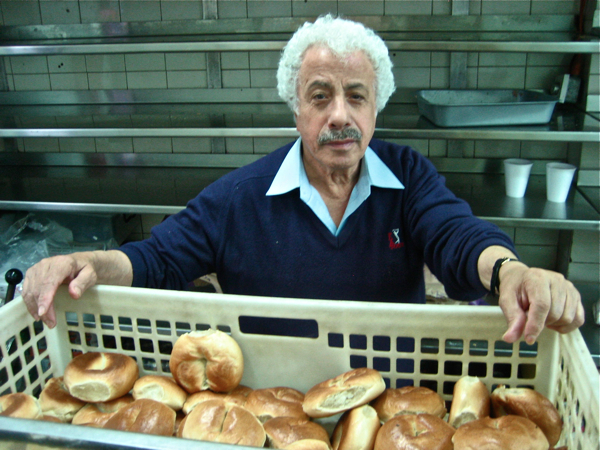 There is nothing better than a hot salt beef beigel, a cup of hot instant Nescafe, and a dozen beigels to take home in brown paper bags. 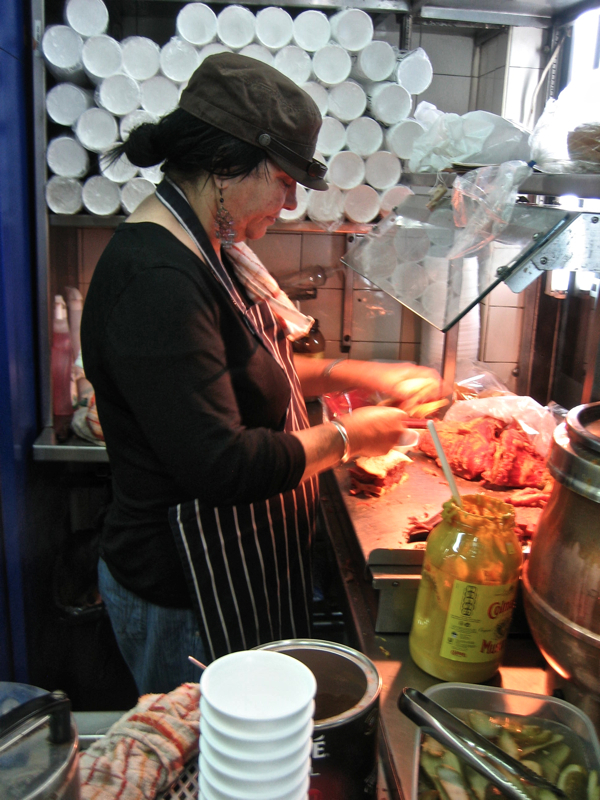 Happy days, if you haven’t tried the delights of the Brick Lane Beigel Bake then you haven’t experienced East London! I live in west london and go to brick lane just to eat the salt beef bagel. My friend prefers the smoked salmon, but whatever filling we go for its still one of the best. Stumbled over your blog via casebook.org. What a find! I used to work on Bethnal Green Road and could always be found wandering round the area come lunchtime soaking up the history and atmosphere. We used to play “spoof” to see who would buy the beigels from the BL BB! I remember Spitalfields market as a fruit and veg market too. So glad the buildings were saved. 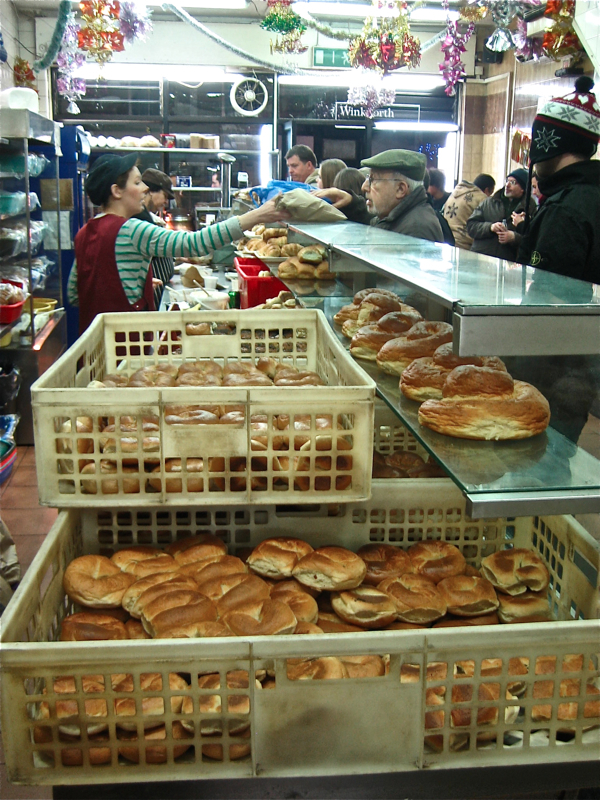 Me and the significant other had a salt beef beigel from here last Sunday night, and it was delicious as always. The shop hasn’t changed a jot, unlike the area around it. Long may it, Mr Sammy and this blog reign! ah, the beigal bake, I have been know to get a fancy for a egg and tomato beigal at 1.30 in the morning, jump in the car and drive for half an hour to get there, used to live 10 minutes away, do the sunday newspapers still get sold late on a saturday night from a the stand outside? Even as a kid I was told beigal’s had to come from this shop, not the shop down the road, don’t know why. ………………and the cheese cake, heaven !!!! Just found this article , it was great . 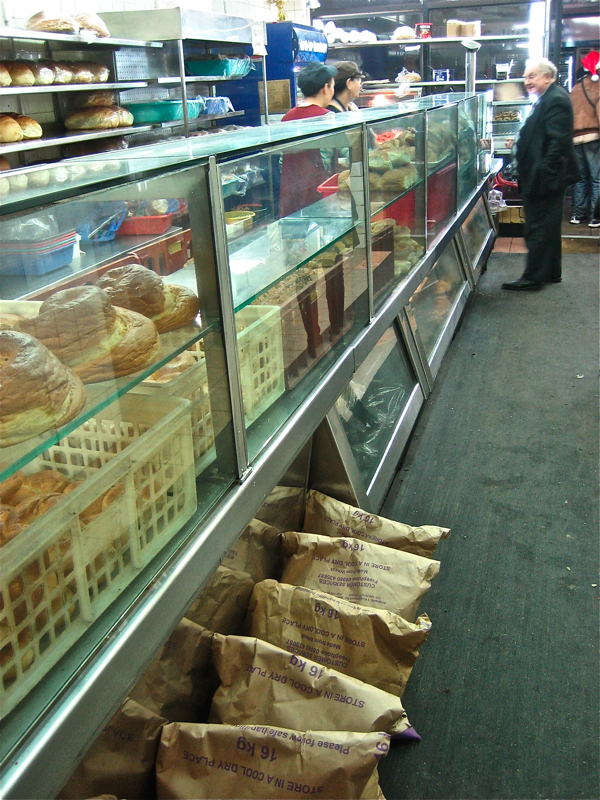 I had a factory and design studio in the east end for years, I walked past the Begal bake every day and stopped to buy a second breakfast , I miss this area as it was, not so much for what it has become, so its good to know its still there.I moved away 14 years ago . 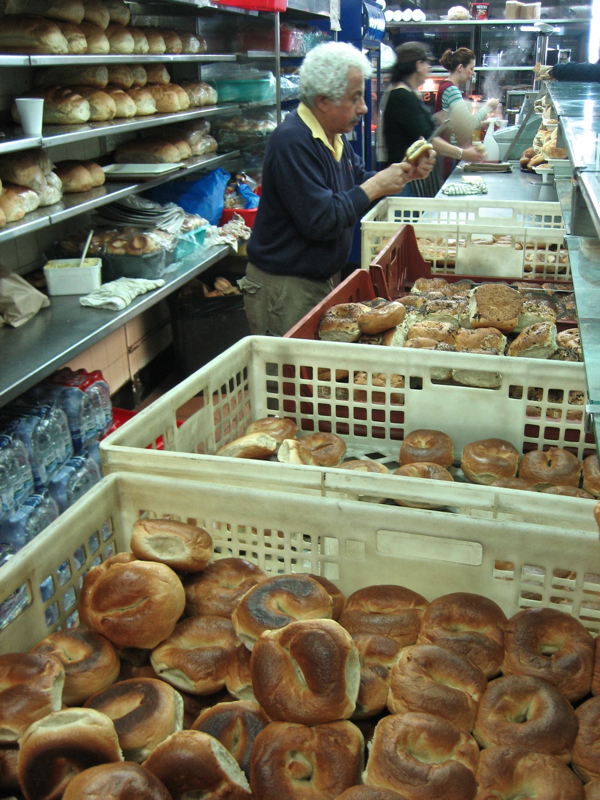 My family have been eating here for more years than I can remember they are simply the best bagels money can buy the salt beef is just lush, whenever I’m working near by or visiting london. We end up in brick lane for salt beef bagels smothered in mustard and gherkins . 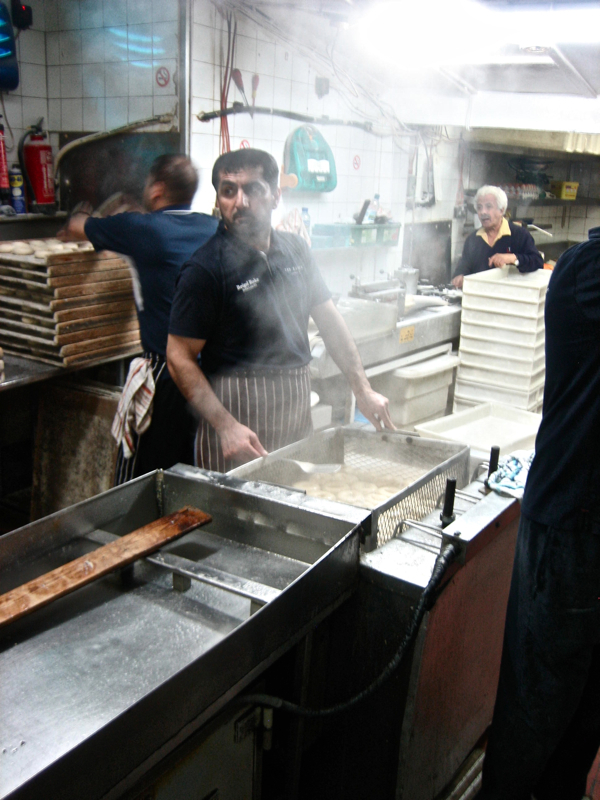 Wonderful piece on an iconic institution, and the best value meal in London! Greetings from Canada! My daughter is living in Spitalfields, not far from the market. I am enjoying these articles, so well written, as they tell me about her surroundings and life around her! Well done! Do you sell Cheese Buns? I remember these growing up and they were sold by weight? Please let me know so I can pay a visit. Just found this article and at last the correct UK spelling of these delights as mentioned in an earlier comment. 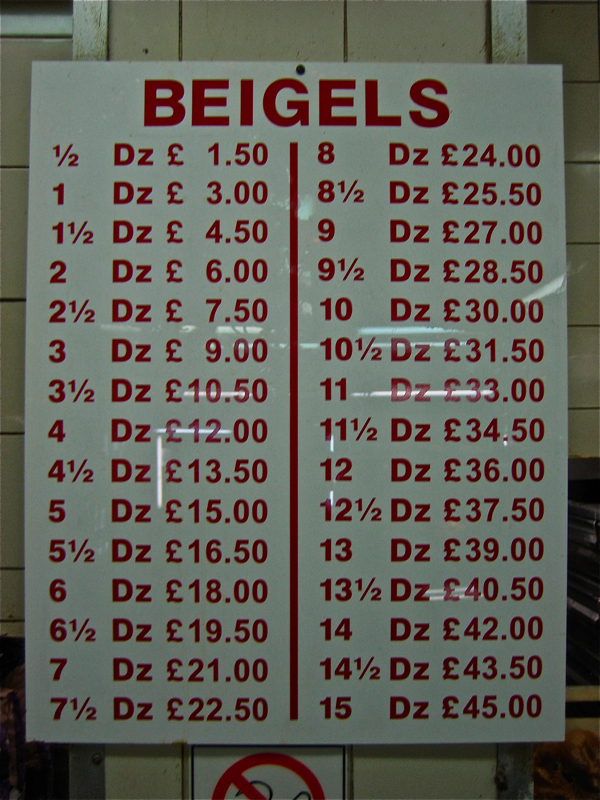 I went to school in Spitalfields and grew up with beigels introduced to me by Jewish classmates (pronounced by-gals) not bagels, which spelling and pronunciation seem to have taken over and people think I am mad with my crusade to continue to pronounce the name correctly (at least as far as Londoners are concerned! ).